As campaign rhetoric reached fever-pitch last week in the run-up to the LG elections on Saturday (10), the government stumbled on an unexpected news-nugget to feed its propaganda mill. It came in the form of reports that Udayanga Weeratunga, Sri Lanka’s former ambassador to Russia and Ukraine, on whom court issued an arrest warrant in October, had been detained for questioning at Dubai airport on Sunday (4). This news snowballed in a manner that left the impression that the government was about to secure the extradition of a criminal ‘Red Noticed’ by Interpol. Several media reports referred to an ‘international warrant’ having been issued for Weeratunga’s arrest. 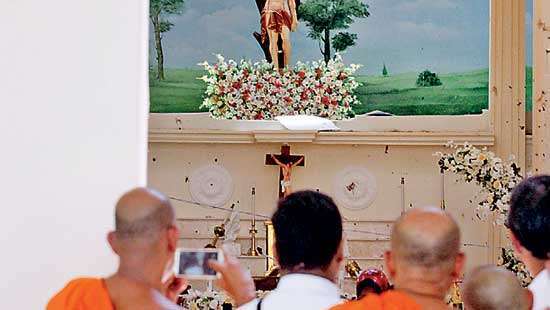 The story dovetailed nicely with the ‘yahapalana’ government’s professed commitment to punishing the corrupt, especially from the Rajapaksa regime. Weeratunga is a relative of former president Mahinda Rajapaksa. 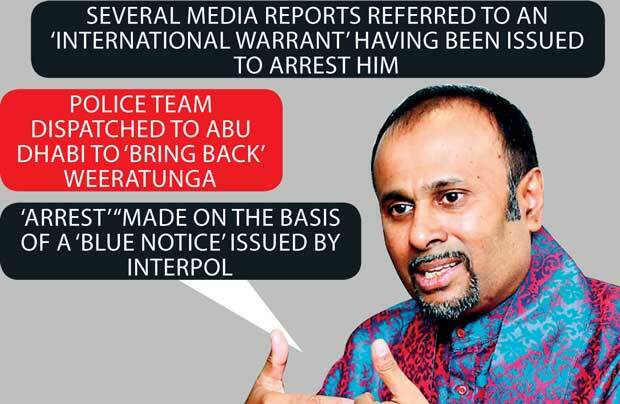 It was not until Weeratunga himself made a statement on an evening TV news bulletin on Thursday, posted also on Facebook, that it came to light that Abu Dhabi authorities had acted to detain him on the basis of an Interpol ‘Blue Notice’. Weeratunga dismissed as untrue the claim that he was under arrest. He said the Interpol officers knowing they had no right to have a person arrested on a Blue Notice, released him after duly questioning him regarding his address and other details. Still, the Police Spokesman was unable to confirm on Friday (9) whether it was a ‘Blue Notice’ and not a ‘Red Notice’ that had been issued. 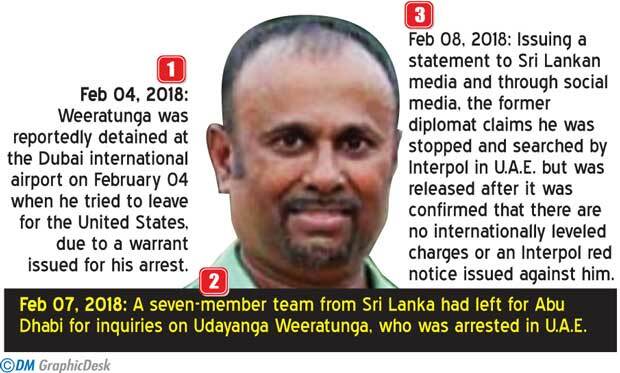 It was only by Friday evening, by which time much of the damage in terms of misinformation had been done, that the Ministry of Foreign Affairs and Ministry of Law and Order issued a joint statement saying Weeratunga “was intercepted in the UAE on Sunday 4th of February 2018 when he attempted to leave to the United States.” Somewhat ambiguously it said he had been released subsequently, but was prevented from leaving the UAE till investigations were concluded. 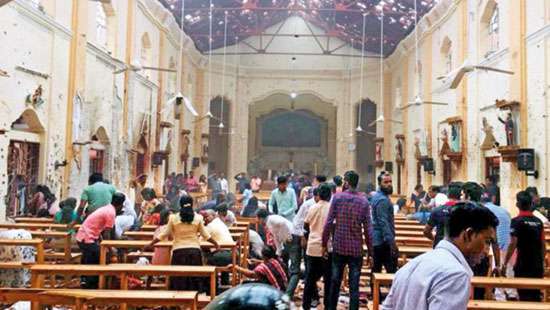 It described his detention as an ‘arrest’ “made on the basis of a Blue Notice issued by Interpol” and said a delegation of Lankan officials was in discussion with UAE authorities with the aim of deporting him. Although there is no Red Notice on Weeratunga, politicians (including minister Mangala Samaraweera in parliament as recently as in May last year) have routinely and deceitfully referred to a Red Notice having been issued on him, in parliament and at press briefings. If a Blue Notice is to collect additional information about a person in relation to a crime, then what is the crime in relation to which information on Weeratunga is sought? If we are to go by the stories vigorously propagated by some politicians, there are many. They include allegations of ‘supplying weapons to separatist rebels in Ukraine,’ the murder of an embassy employee, and fraud relating to the purchase of MiG-27 aircraft. In 2015, then Foreign Minister Samaraweera fed the dramatic story of ‘weapons smuggling to Pro-Russian Ukrainian separatist rebels’ to the media. Since then other UNP parliamentarians too have pitched in from time to time, elaborating on this and other assorted claims. 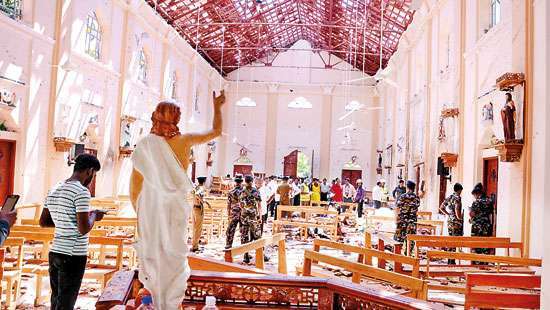 But of late the ‘Udayanga crime list’ has been whittled down to the MiG-27 fraud allegation, and the government has gone relatively silent on the other accusations. And no wonder. A BBC Ukraine report of March 23, 2015 refuted Samaraweera’s claims regarding Weeratunga’s involvement in ‘weapons smuggling,’ quoting Ukraine’s foreign ministry spokesman Yevhen Perebiynis saying “this information has not been confirmed.” Though Sri Lanka’s foreign ministry alleged that the government of President Petro Poroshenkov had complained about Weeratunga’s activities, for which he was being investigated, the Ukrainian mission, then based in Delhi, said “the Embassy does not have information concerning investigations against Mr. Weeratunga.” The statement dated May 10, 2016 was in response to an email query seeking clarification as to whether Weeratunga was under investigation by Ukrainian authorities for any wrongdoing. As for the allegation that Weeratunga was involved in the murder of Noel Ranaweera - an employee of the Sri Lanka embassy in Moscow - the Press Secretary of the Russian embassy in Colombo, Evgeniya Altukhova confirmed on May 6, 2016 that Ranaweera died in a motor accident. Udayanga was not a suspect, a Russian man has been convicted and the case is closed she said, responding to a phone query. The only allegation against Weeratunga that has not yet been decisively trashed is the vague accusation of fraud in connection with the Defence Ministry’s US$14 million purchase of four Ukrainian-built MiG-27 aircraft in 2006. The court twice rejected the FCID’s requests to issue an arrest warrant on him before finally acceding to the request after they named him a suspect in a B-Report in October 2016. Udayanga Weeratunga may not have been an exemplary diplomat. He may have breached diplomatic protocol in failing to surrender his cancelled diplomatic passport. He may have irritated foreign ministry officials by not making timely arrangements to have the container with his personal belongings cleared from the port. He may have been an altogether troublesome officer. But does any of this justify the campaign of vicious lies directed against him by political opponents? In the public eye it would seem he is already a murderer, arms smuggler and big-time fraudster. Punishing the corrupt is all well and good. But given the trajectory of Weeratunga’s case, since the change of government in 2015, his would seem to be a case of ‘give-a-dog-a-bad-name-and-hang-him,’ rather than anything like a crusade against corruption.